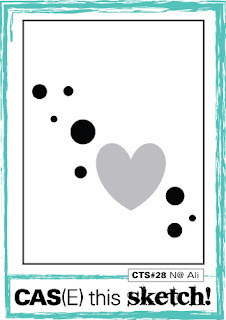 Crafty Girl Designs: Dot Love! very pretty. love the big embossed heart! Love the bokeh feel from those dots and the beautiful embossed heart! Thanks so much for joining us at CAS(E) this Sketch this week! Wow, Anita, you would never guess you didn't see the sketch first! Great card, especially that big gold heart. Poor sweet Ariel! Hope that it passes very quickly! Love the gold embossing and perfect placement of the dots! wow awesome card.. love the embossing..
Amazing that the card was exactly like the sketch. It is beautiful Anita. And what a thoughtful brother Carter is. That is amazing that you made the card before seeing the sketch! I love the gold embossed heart and how the design flows. Hope Ariel is better! Ok, that is scary! Crafty telepathy maybe! I love that embossed heart Anita! wonderful take on this sketch, beautiful!! Seriously?! Your 2 brains must have connected even though you didn't know it! Terrific card, Anita! Fabulous card! I love that embossed heart. Thanks for playing along with us at CAS(E) this Sketch! So funny that you had this perfect take already done! Love the heart - my fav image! Do enjoy your weekend and hope you get some dry time. Hugs!